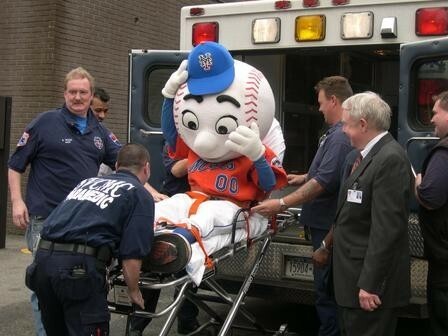 I can understand not wanting to leave Shea Stadium, but don’t take it out on the mascot. A 32-year-old man who was accused of harassing "Mr. Met" at a game back in May has pleaded guilty, the NY Daily News reports. Police said that after Christien Hansen took the unspecified anti-mascot actions — allegedly "swatting" children out of his way to do so — he then refused to leave the stadium when asked and took a swing at a security guard. Hansen was ordered to pay a $500 fine, and perhaps more importantly was also banned indefinitely from Mets home games, including those at the new stadium. Last weekend, seventeen Mets fans were arrested at Shea Stadium for trying to tear out and steal parts of the stadium after the last game was played there.